You could ask your mother how to bake a cake, or you could ask Google or Siri. You could sit wondering what your high school crush made of their life, or you could check Facebook. You could go shopping with your friends at the mall, or have Amazon bring the mall to you. Were those cat memes not so absorbing, we may find ourselves questioning how humans used to do everything without the internet. The internet age has brought an increasing share of our lives online, and as Stephan Hawking has painted our new reality, “we are all now connected by the internet, like neurons in a giant brain”. The question then becomes who is constructing the brain itself. While vast arrays of constructors are building the platforms through which we connect, a small number of chief architects have risen through the masses to dominate the internet landscape. When it comes to these architects, they don’t come much bigger than Google, Apple, Facebook and Amazon. According to a Statista survey in March 2017, these internet behemoths are all now household names with more than 90 percent of respondents knowing the brands, at least by name. Google comes out on top as the most recognizable at 96 percent. Gmail, Google Maps, YouTube, Chrome and the Google.com search engine are the most commonly used from the range that seems to cover every reason someone would ever venture onto the internet. This dominant presence means that around 69 percent of people use at least one Google service or product daily. However, Google is not alone in their desire to spread beyond their initial services when the development of the giants is brought into focus. Facebook’s purchase of Instagram and Amazon and Apple’s movements into entertainment through Amazon Prime and Apple Music serve as prominent examples of these desires. Given their ever increasing reach, it should come as no surprise that more than half of Americans believe the four giants that comprise GAFA. (Google, Apple, Facebook and Amazon) have become an integral part of our society. Though their architectural influence on society is greeted with skepticism by many as the 31 percent of people who think that influence is too much would suggest. 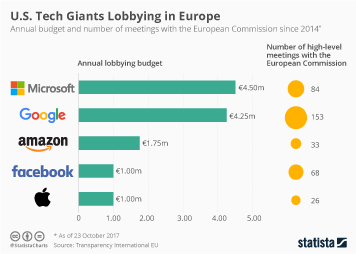 As we share more and more of ourselves online, their publically or privately, the amount of our personal information GAFA have access to is ever increasing. Although the mere 32 percent of people thinking Amazon respects their privacy might seem low, it’s an improvement on the 25 percent for Google, 19 percent for Apple, and 14 percent for Facebook. Though this mistrust does not appear to be detrimental as 87 percent of people have a Facebook account and 72 percent use it daily. The giants of GAFA will likely continue to purchase competitive startups that pose an alternative to what is becoming business as usual for the biggest players in the internet game. It seems that concerns around information use and societal influence are not enough for consumers to abstain on mass from the largely free services they provide. Perhaps autonomy is a price consumers are willing to pay.